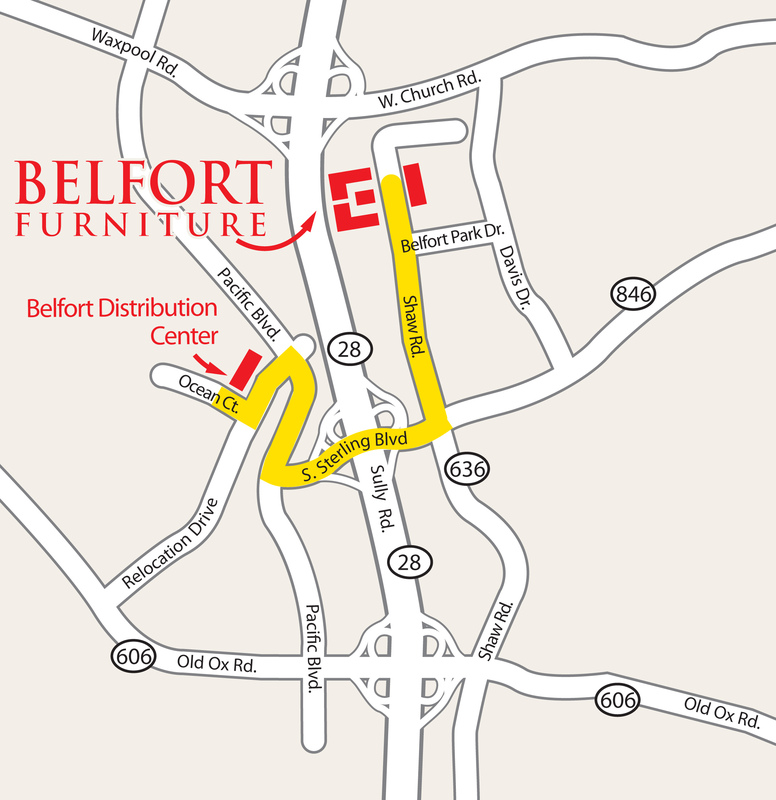 Furniture may be picked up at our Distribution Center and Clearance Center. Some furniture may require assembly; please see your salesperson for details. Please remember to inspect your furniture thoroughly before leaving our warehouse. We will assist in placing your merchandise in your vehicle, however, proper loading and securing of the product is your responsibility. No damage claims will be accepted once the furniture leaves the warehouse. Our Distribution Center is conveniently located approximately 1.5 miles from our showrooms. From Belfort, turn onto Shaw Rd. going south towards Sterling Blvd. Turn right onto Sterling Blvd., (Route 846 West). At the traffic signal, turn right onto Pacific Blvd. Turn left onto Relocation Drive. Take an immediate right onto Ocean Court. Our warehouse is the first building on the right. Follow the custom pick-up signs to the rear of the building. The customer pick-up entrance is the first door on the right on the back side of the building. Our Clearance Center is located in the Belfort Park complex in Building 3. It is directly across the street from our Galleries, Interiors, Mattress, and Kids Showrooms, and is part of the Basics Showroom. If you purchased an item from our Clearance Center, please go to the Basics Showroom sales counter for assistance. Please note, our Warehouse Sales are held out of our Clearance Center, NOT the Distribution Center! La Bodega esta convenientemente localizada a 1.5 millas aproximadamente desde nuestras tiendas. Desde Belfort girar hacia el Sur en la Shaw Rd hasta llegar a la Sterling Blvd. Girar a la derecha en la Sterling Blvd. (Route 846 West). En la se?al de Pare, girar a la derecha en la Pacific Blvd. Girar nuevamente a la izquierda en la Relocation Dr. Tomar la primera derecha en Ocean Court. Nuestra bodega es la primera edificaci?n al lado derecho. Siga las se?ales de customer pick-up hacia la parte posterior. La entrada a customer pick-up es la primera puerta al lado derecho en la parte posterior del edificio.